fostering business to business (B2B) trading. and Open Air Cinema and Night Market. The BID will work with the CB1 team to host events and activities, making full use of the different paved and green areas on the site. Below is some more information on BID. Cambridge BID consists of 1,200 city centre businesses, working together to promote the city to visitors, residents and workers, while ensuring they experience a welcoming and vibrant street scene that is both clean and safe. Their vision is to ‘create a world Class experience for all visit, live and work in Cambridge, a global city’. Why did Cambridge get a BID? There are over 300 BIDs in the UK so the model they work to is well established but the projects they deliver are very Cambridge specific. Cambridge BID was developed from the previous entity Love Cambridge, this was a voluntary partnership, however it was agreed by businesses that a BID was a more sustainable model. Over several months in 2012, businesses and organisations within Cambridge were consulted on the feasibility of a BID for Cambridge and what they would want the BID to deliver on behalf of businesses over the five year initial term of the BID. The Cambridge BID Business Proposal was produced following this consultation and all businesses/organisations who were liable to pay the BID levy received a postal ballot form and were encouraged to vote for or against the Cambridge BID, based upon the BID Business Proposal and projects/initiatives that would be delivered by the BID. The 28 day postal ballot was held in October 2012 and businesses voted in favour of the BID, with a turnout of 33.2% and 67% by number in favour and 77% by Rateable Value in favour. During 2017 a similar consultation and voting process was held, the business plan for their second term proposed to include Hills Road, Station Road and the CB1 development in the BID area. The second ballot had a much increased turnout out of 45% with 84% in favour by rateable value and 80% by voting number. What are the projects that Cambridge BID delivers? In their second term they are delivering projects across these three key themes with their consumer facing projects being delivered under our Love Cambridge consumer brand. 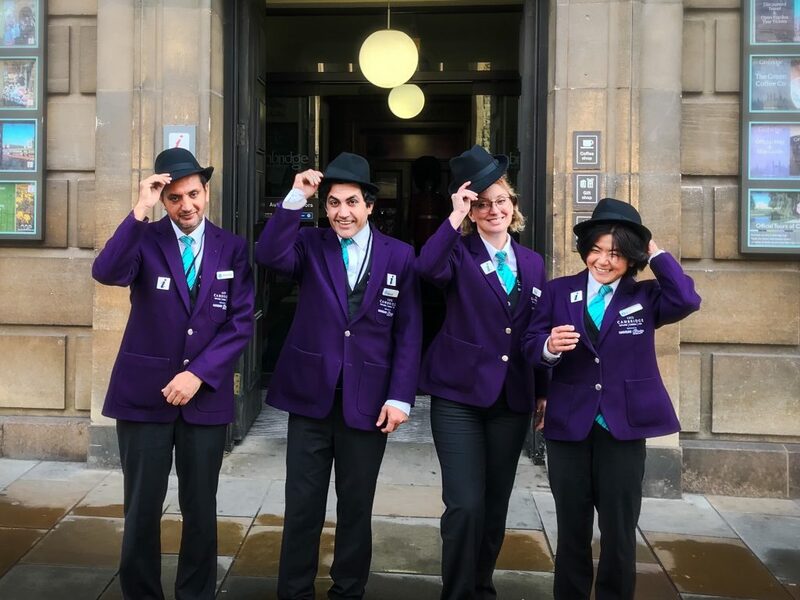 This includes the team of City Ambassadors who meet and greet visitors on street, their City wide Christmas lights to make the city sparkle at Xmas, the additional street cleaning and rapid response cleaning they fund as well as their support of the night time economy with their street pastors, taxi marshals and their aspiration to be awarded the Purple Flag for a safe night out during these 5 years. This encompasses a range of events to bring the city together and get residents and workers to explore their city more. This is done through their programme of Film and Night Markets, their screening of Wimbledon, their Christmas Lights Switch and a range of maps, guides and promotional and seasonal publications for the City. Projects here include their mystery shop awards to ensure businesses are offering excellent customer service to visitors, the Love Cambridge gift card to keep spend local and in-store, their cost savings initiative that is aimed at Independent businesses, their dedicated Independent business fund for promoting this important sector and their performance monitoring activity where they publish footfall and other data to evaluate how the city is performing and being accessed by the visitor. In CB1 they deliver various projects. Their ambassadors are regularly at the station meeting and greeting visitors. In July, they did showings of Wimbledon, next to The Tamburlaine Hotel and this was popular with lunchtime workers and early evening commuters. This will be happening again this year from 1st July to 14th July 2019. In April and August 2018, they deep cleaned Hills Road and Station Road. They also launched the Love Cambridge Gift card that can be redeemed in a number of CB1 businesses including The Ibis, The Tamburlaine, Old Ticket Office and the Station Tavern. More information can be found at: www.love-cambridgegiftcard.com. In November they switched on Christmas lights on 30 lampposts along Hills Road and Station Road and this along with their interactive Christmas tree outside the railway station provides a vibrant gateway to the city. They are currently looking to develop a Hills Road, Station Road and CB1 business advisory group supported by their newest Board member Simon Wallis from Brookgate. This group will enable BID projects to better meet the needs of the CB1 BID community and their employees. They look forward to working with all CB1 businesses during this continued growth phase for the area as they strive to offer a world-class experience for all in terms of a welcoming and vibrant street scene and a clean and safe environment. How do I find out more information about Cambridge BID? For more information on Cambridge BID, please follow @LoveCambridge_ on twitter for their consumer projects and @CambridgeBID for business projects.